Yesterday, my daughter and her boyfriend left after a couple of lovely days staying at my brother in law's cottage at the beach. 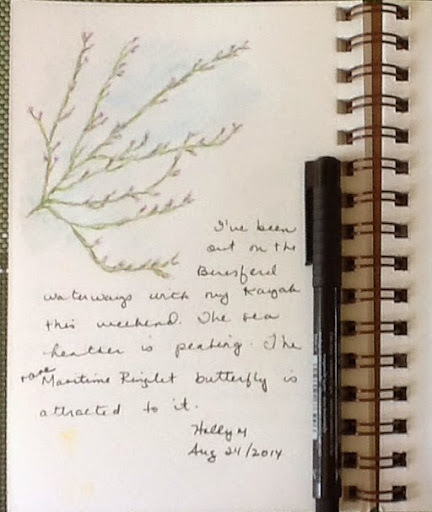 My husband took a day off, one of the hottest this summer, and we enjoyed it too. 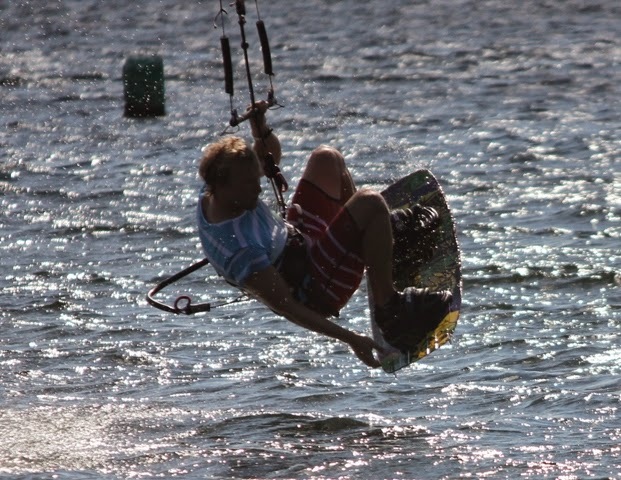 My daughter's boyfriend brought his kite boarding equipment with him and we were treated to a demonstration. I've never seen anyone doing it here before, but there were 2 others out that day. It was windy and really warm. It looked like such fun! I think they enjoyed their time-- a little break before it's back to work and university classes which start next week. They left yesterday morning, but I didn't have much of a chance to be sad as it was my day to head to the local craft shop. In the evening, it was cooler, and I took my bicycle along with my camera out for a spin on the trails. I've been frustrated since I haven't been able to walk the trails due to my hip pain.we find ways to compensate and adapt. Nights are cooling, dusk is setting earlier, and look at those leaves! Fall is slowly encroaching. There is always something fascinating to photograph. Only a few blossoms clinging to the fire-weed. Most of them are done. When in full bloom, the fields are ablaze in a swath of pink. I love the spiky designs once the petals have fallen. On my bike ride last week the fields were full of those delicate spikes, but by last night they had turned to fuzz. I've just looked it up. 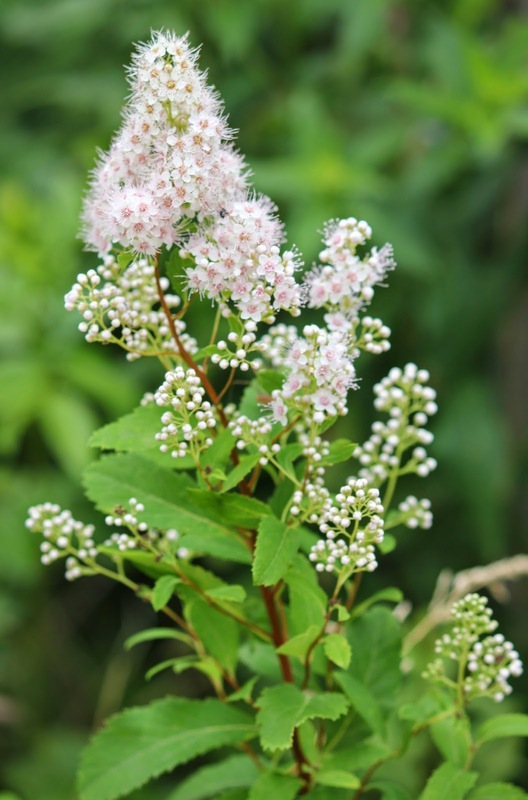 The fluff is a type of down which bursts from the spike capsules and aids in seed dispersal. One of summer's last blooms, I couldn't resist these delicate little white wood asters. 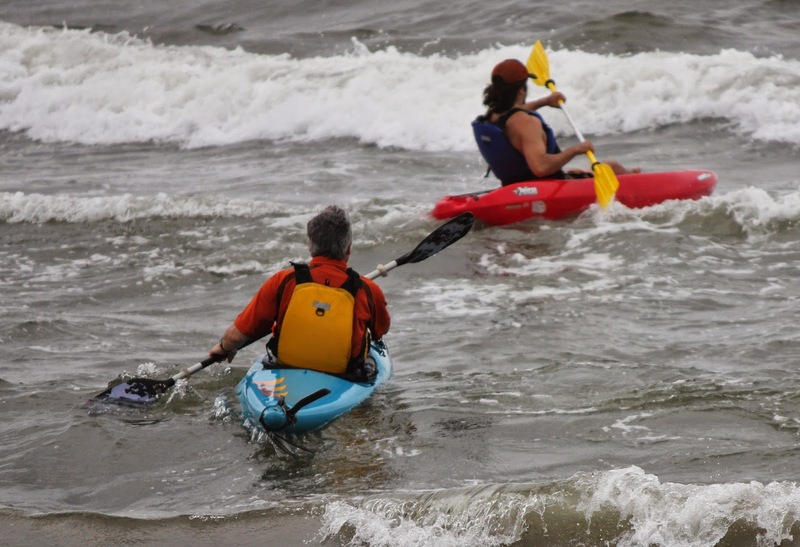 Do you love it when there has been a stretch of hot sunny weather beach weather, followed by a rainy day? That's just what we've gotten. 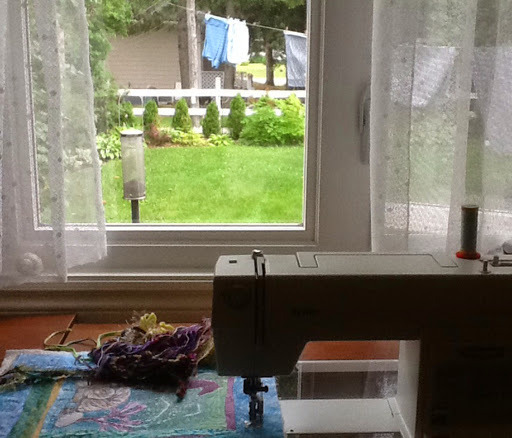 My sewing studio window is open and I'm listening to the rain and the gusty wind waving the branches and leaves on the backyard trees. It doesn't deter the goldfinches from chasing each other noisily in between eating from the finch feeder in front of my window where I sew. Oh dear, I was waxing on about how lovely it was when I heard a noise and my power went off. It was only off for about a half hour and I was pleasantly surprised to find my post saved mid sentence. This afternoon, I added the backing and binding to the Seahorse. I will need to photograph it again when the sun comes back out. I've sold my mug rugs that were at the shop, so I pulled out my scrap bins and came up with this combination. I left it ready to quilt in my next session in the studio. I found lots of interesting bits that would make great mug rugs. It's a great way to use up the extra printed bits (this one is a resist screen print) and pieced scraps from quilted projects. Summer has returned with sunny hot weather and I've not been into the sewing studio in a few days. In my little snippets of time around my meal with my tea, I've done a couple of seasonal sketches. 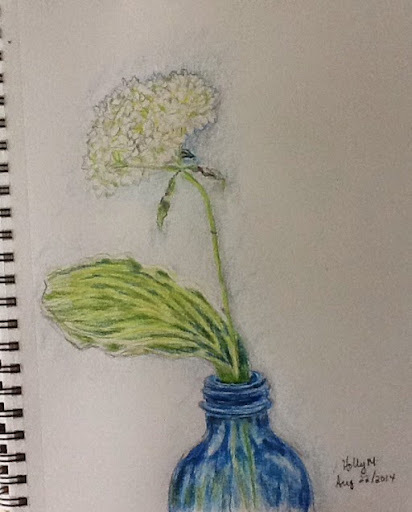 The first one of some early hydrangea, I worked on over two days. I was out in my kayak both Saturday and Sunday exploring the Beresford waterways that are rife with sea heather right now. This is apparently the main attraction for a rare butterfly called the Maritime Ringlet. I won't get back to my sewing now for a few days as my daughter and her boyfriend are on their way for a visit at the cottage until Wednesday. My husband is taking tomorrow off and it looks like the weather will be good. Before lunch, I went for a little bike ride along some trails near our house. The tansy and the pearly everlasting are slowly turning brown and I wanted to gather one more bunch before their season passes. It's something I do every year recently. 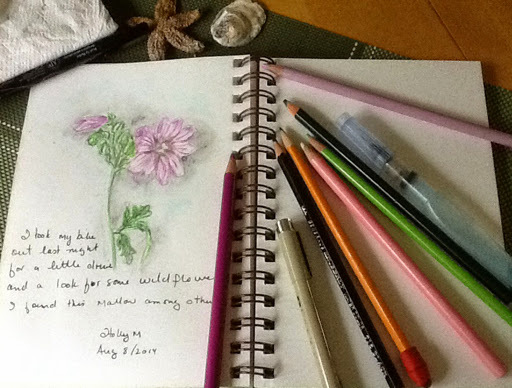 My bouquets and their sketches are becoming visual recordings of the ebb and flow of seasonal flora and fauna. My backyard and the nearby trails have become my observatory, full of color, texture, and sounds, providing me with endless fascination and sometimes simple wonder in the moment. Bringing a little bit of it inside makes me happy when I glance at it in passing or view it up close while eating. After lunch, I intended to head to the sewing studio to get back to the free motion quilting on an unfinished table runner. I made a cup of tea and since it is a bit of an overcast day and not too hot on the deck, I headed there to sit and drink my tea. I'm easily distracted by colourful things. 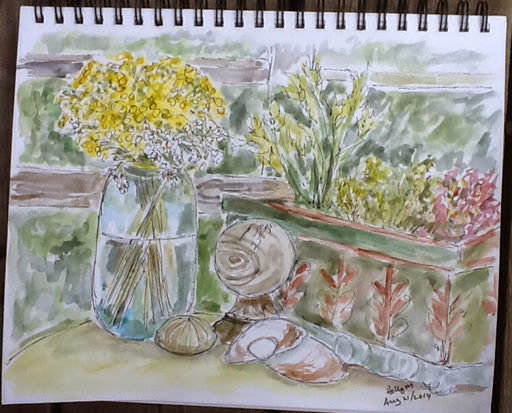 I ended up pulling out my sketchbook, pen and paints to do a sort of gestural study of my table arrangement. I wanted it to be loose and quick with splashes of color but it still took me an hour. Maybe another day, I could start with the brush, laying in large strokes of color, adding the pen later. Now, it's almost time for a quick little snack and I'm supposed to be taking it easy so I can go to the golf course to hit a few balls with my husband tonight. Since the seahorse piece is not very large, it didn't take me too long to finish up the wavy quilting lines and add a few fiber embellishments. I'm still planning to add a few final hand touches in the foreground--perhaps some embroidered shells and some beads. 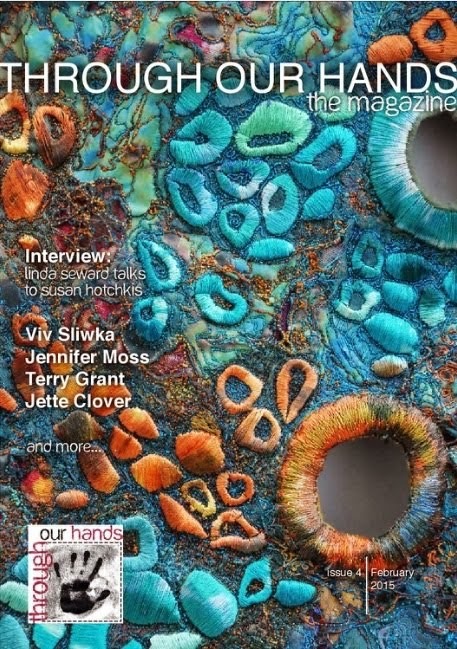 I've got this absolutely wonderful book by Judith baker Montano called Free-Form Embroidery transforming traditional stitches into fiber art. Her seascapes and landscapes are so textured and luscious, that you could enjoy it just for the beautiful photos. 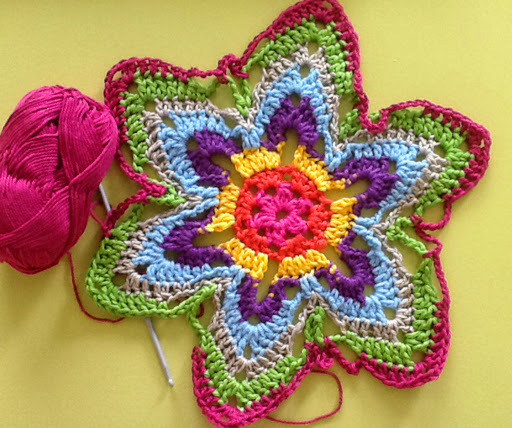 There are lots of how to's and simple stitches to get you inspired. In between, I've been adding a few more rows to my mandala. They really are addictive. I see more in the future. They're so colorful but I could also imagine some done in monochromatic shades of blue for example. I love this kind of day. It is breezy and cool enough to have pulled open the windows and my summer sheers are gently blowing. The sheets are on the line even though there has been the odd shower. There is birdsong accompanying the tinkle of my various garden chimes. I organized the almost finished deck. Each time I take a little break, I've added a few more rows to the star mandala. It's going to make a very cheerful table center. My sewing studio is pleasant too. I sew facing the window where I feel the breeze, hear and watch the birds and look at my garden. 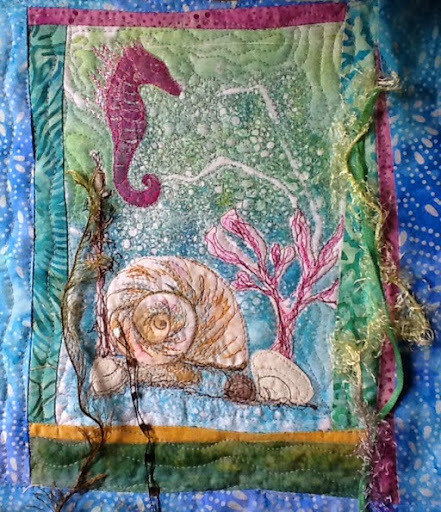 I've almost finished the free motion quilting on the seahorse piece and I've been having fun trying out some fibre embellishments. I'm planning to finish up the machine work so I can take it with me to the shop where I'll work on a bit of hand embellishment. Well, my eldest son and his wife have been for a visit and gone yesterday. They stayed at my brother in laws cottage for a couple of nights, and despite rather dreary weather we had lots of fun. This week with the full moon the surf has been up on the Baie de Chaleur, such as it is here. 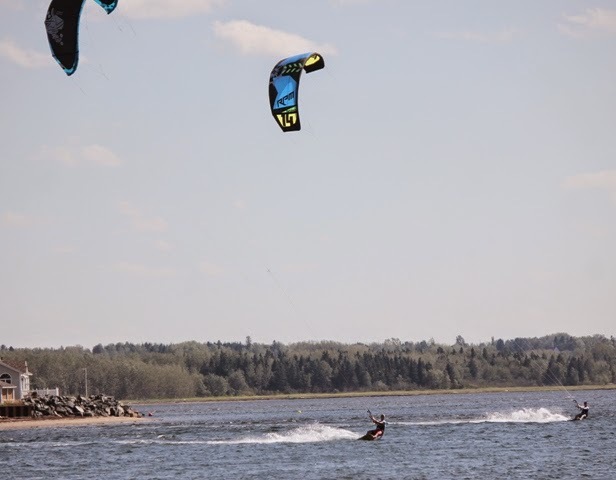 Being on a bay, we do not get big surf like the Atlantic Ocean coast where my son lives and surfs in southern Nova Scotia. but they were big enough for lots of excitement with the kayaks. 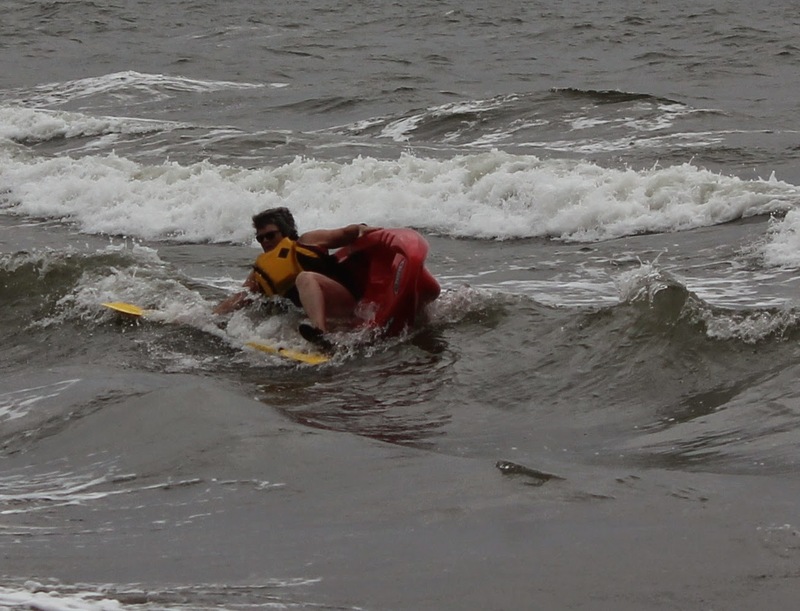 The hardest part was getting out and then the rush was turning and surfing in to shore. Even I had to try it once. I was out for about 10 minutes and it was enough to strain my shoulder. It was so exhilarating though. I can't do much right now with my arthritis problems, so it's nice to have a little fun. Shortly after this I caught a wave in and then got dumped. Lots of fun! Bear in mind it was a grey, cool-ish day and we were the only ones in the water. You gotta play when you can! Today, my husband went to the golf course and I went to the market and then on to my mother in laws at the beach. We sat busy with our needlework and lunch in the sun room facing the water--there were large rolling waves coming in from further out -and the sound was lovely. 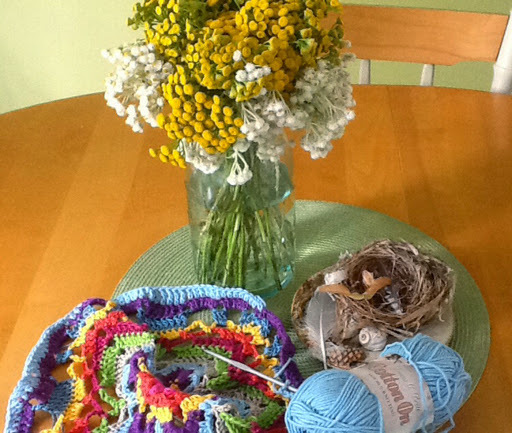 I've been inspired by the latest blog craze of colorful crocheted mandalas. Using some cotton yarns from my stash, I started this star mandala. I kind of wanted to come home to my sewing studio, but I knew I needed to get out for a bit of exercise in case we get the thunder showers predicted for later. The sun is shining for now. I loaded up my camera and went for a little bike ride around the neighborhood. I cannot walk right now due to hip pain,but I can bicycle in an easy gear on the flat. On the bright side, I notice a lot more things when I'm not out for speed. I found these berries along a little pathway between streets. I like the star burst formation. I love the way these red ones droop down. and the pretty shades of oranges before they ripen. One industrious landlord of a very ordinary and slightly tatty apartment building has made the front space into a lovely garden. He added some sculptures and some art prints to the facade. There will be time to get back to the sewing room. One must seize the moment. My husband is still on vacation this week, so I've not been sewing at all until today. He went to golf 18 holes this afternoon with our nephew. Yesterday, he and I did 9 holes; I can barely manage that. We treated ourselves to lobster rolls in the restaurant afterwards and then we went to the beach for a swim. 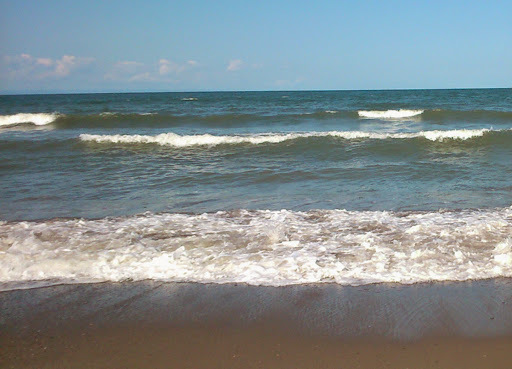 It was about 6:30 and the breeze was cooling, but again, like Sunday, the water was warm and the surf was up. I couldn't do much body surfing-- can't get up and down-- but it sure was relaxing to bob up and down out in the swells. I had a good sleep last night despite the creaky joints! So, this afternoon, after my hubby left, I was quite content to spend time in the sewing studio. I did a couple of mundane sewing repairs to get the room cleared, and then I tried again at putting the curved borders around the seahorse. The first two tries were simply not working for me. I do try to audition fabrics but sometimes I have to see it actually sewn before I decide if I like it, or not. It's a bit tricky to audition the curvy seams. This is more the look I was going for. 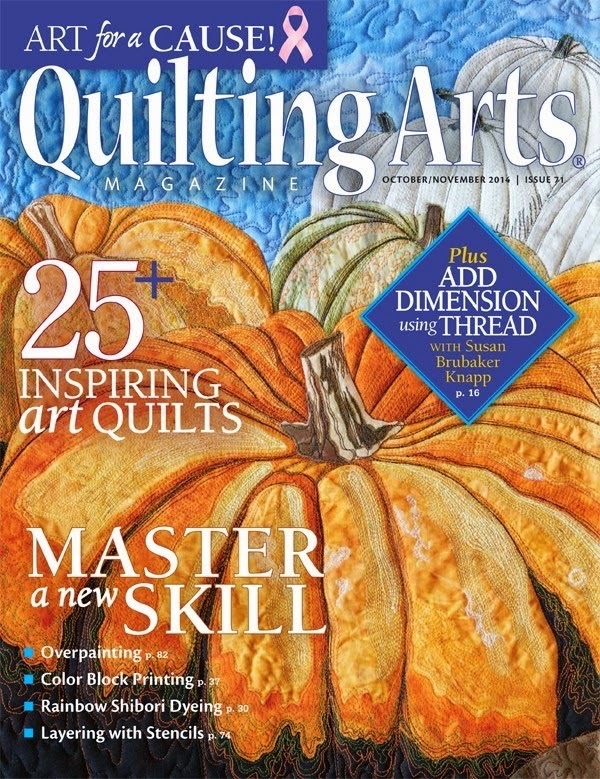 Next session, I will cut some batting and do the quilting. The shell edge in the foreground will be extended horizontally. That really just gets me to the fun part-- adding some hand embellishments. 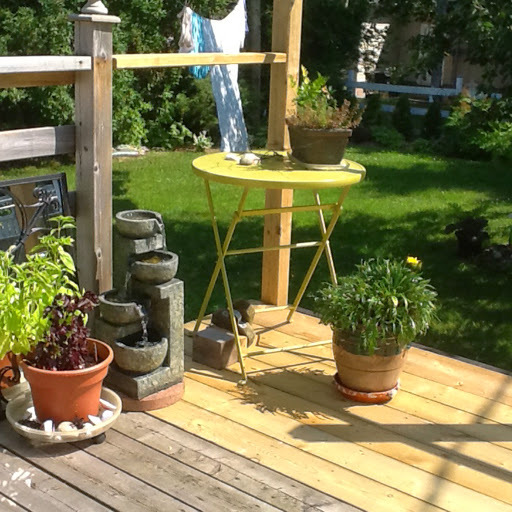 I've been watching my deck extension creep along all summer in between my hubby's golfing. 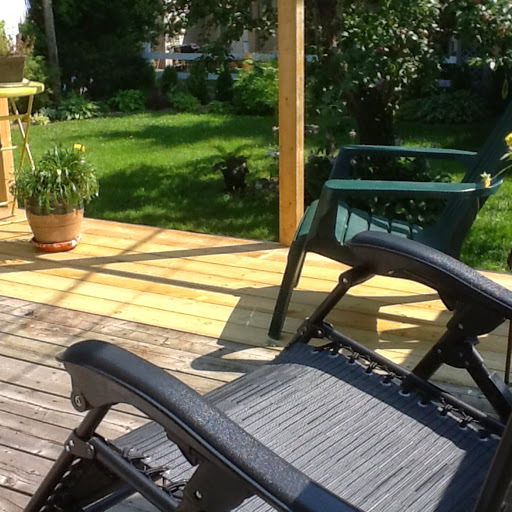 Finally we have the deck! All that remains are the side rails. Of course it proved to be a lot more work, and expense, than he thought. From above it looked like there were 3 support posts. Upon closer examination he discovered 5. Holes had to be dug, sono tubes buried and concrete poured. Then the posts were set onto those. It adds about 3 1/2 feet to our little deck. I am so pleased. Now I'll have room for my swing and the gravity chair. I can choose to lie back or swing while listening to the little fountain and watching the birds. Tough decision! Next year, I'll have some veggie space back too. I have missed that. 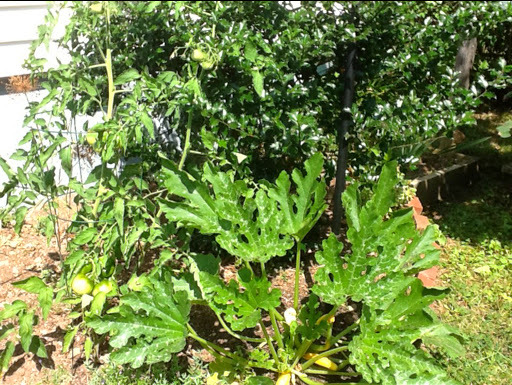 I'm getting a kick out of watching my tomatoes, cucumber and zucchini grow around my holly bushes where I usually would plant some annuals. 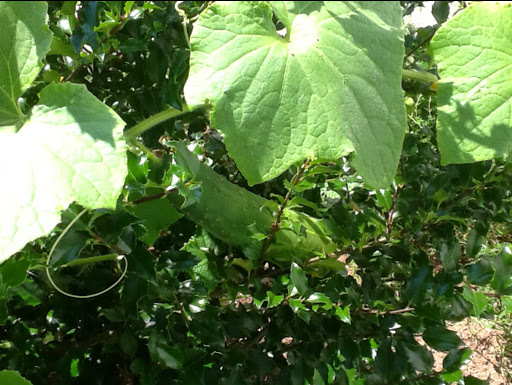 I expected the cucumber to ramble through the garden; however, it has decided to climb through the Holly bush. I discovered 2 cucumbers growing along the branches. On the other side the tomato has decided to use the second bush as a support. The silliest of things amuse me! I'm off to make a cup of tea and ponder my supper. No cooking tonight, yippee! I had a really low day yesterday, after a lot of hip pain and a poor sleep. In the afternoon I managed to do a little work in my garden and we drove to the waterfront after supper for an ice cream. 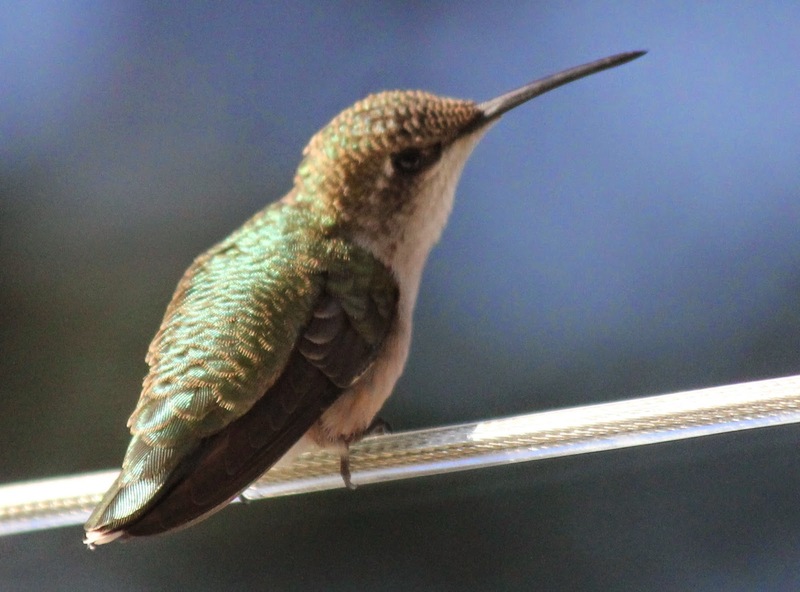 We've spied a pretty little bird in the yard this week. It's quite elusive, staying in the leaves of the apple tree and the hedge. 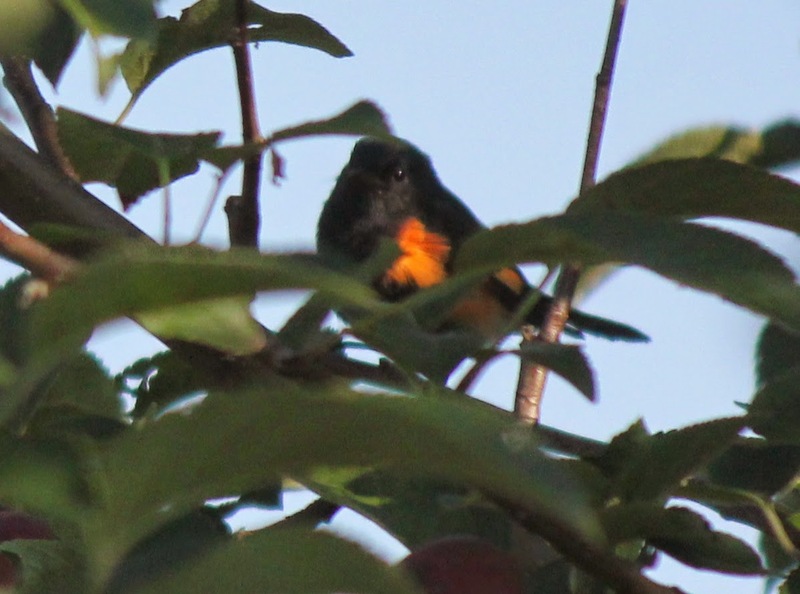 It has been identified on a birding site as an American redstart. I've never seen one before. Today was a beautiful sunny day and we headed to the beach. For the first time this summer while I've been there, the surf was up. 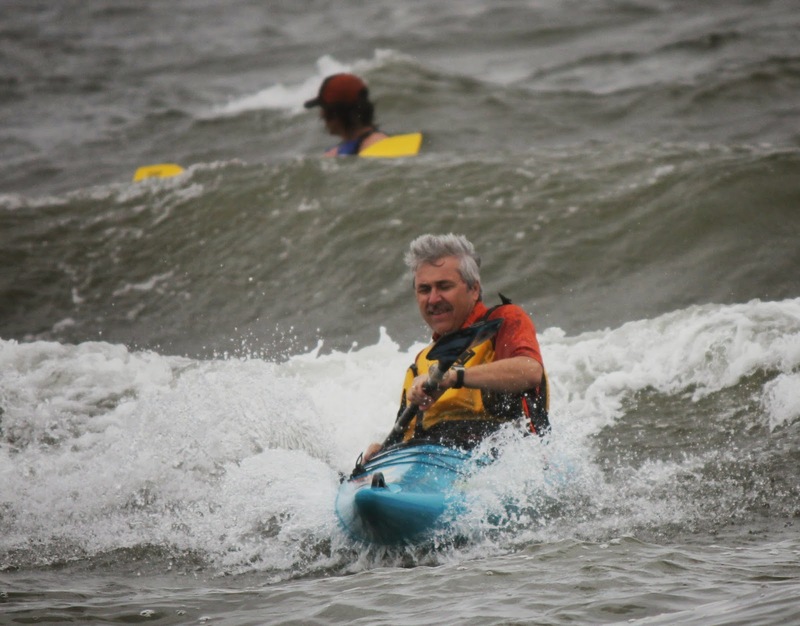 Our in laws live on the Chaleur Bay so we don't often get big waves, but when we do, I love to get in there. We played until we were ready to drop. 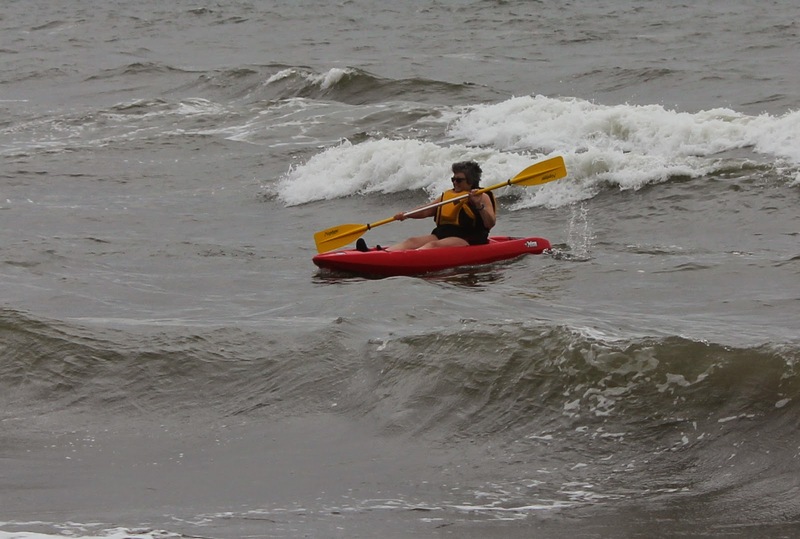 I tried to stay out far enough to float over the waves so I didn't have to get up and down. 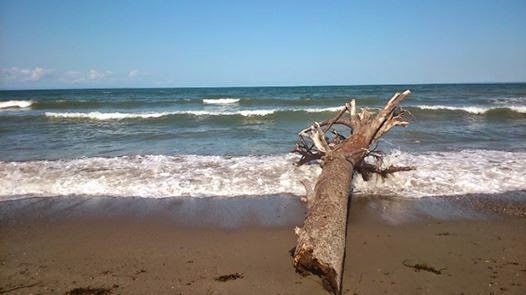 I did catch a few big waves and got tossed right up on the beach like a piece of driftwood. At the end I surfed in and my husband helped me out. What fun! 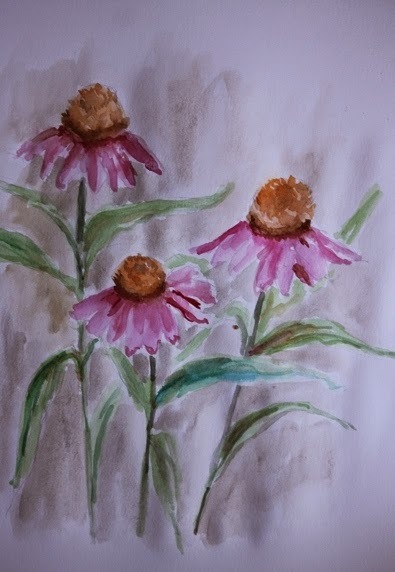 After supper, and a bit of a rest, I felt rejuvenated and took my paints into the yard to do a quick sketch of the cone flowers against the fence. I'm almost embarrassed to post the picture, but I am. I haven't painted outside in ages and need to get used to how fast the paint dries in the breeze. It is what it is; it's all about the process and the feeling of doing it. I want to do more. And of course I brought another piece of seaweed home from the beach. Endless possibilities! My husband has another week off. We are enjoying our time at home, getting up to a lazy breakfast, going out when we feel like it, staying up until we want to. Tomorrow we're going to golf with our nephew. I've been out most of the day but I did have time at breakfast for a small sketch. 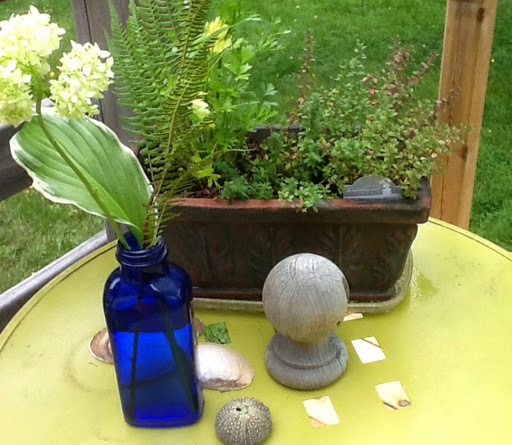 Last night, while on a short bike ride along the trail, I picked a few wildflowers for my jar. I think this is mallow. I found it along the trail behind a fence so it may have migrated from someone's garden. After that, I was out for the day. Not all busy-ness though. I had lunch with friends, and a respiratory test at the hospital, results not great. I have to be better at using the puffers. Then I went for a swim at a spa pool very near my house. I had a leisurely supper since hubby is off golfing again, picked up the house a bit and did some yoga. So, I've been good to myself. I hope you will be to yourself too! Had visits with my daughter and her boyfriend, lots of nieces, nephews, brothers, sisters and mom and step dad. I didn't even take the camera out of it's bag until we hit the nature park on this side of the Confederation Bridge. This is a photo looking west from the beach that I took last year. When the water is warm, as it was this weekend, the swimming is wonderful! My husband kindly stopped every hour or so for me to get out and stretch my legs.My hip joint has become very painful. I am waiting for xray results which because of summer vacations could take a few weeks. There were lots of wildflowers along the pathways that caught my interest. These reminded me of a sprinkling of pink stars. I can't identify it from my wildflower book. 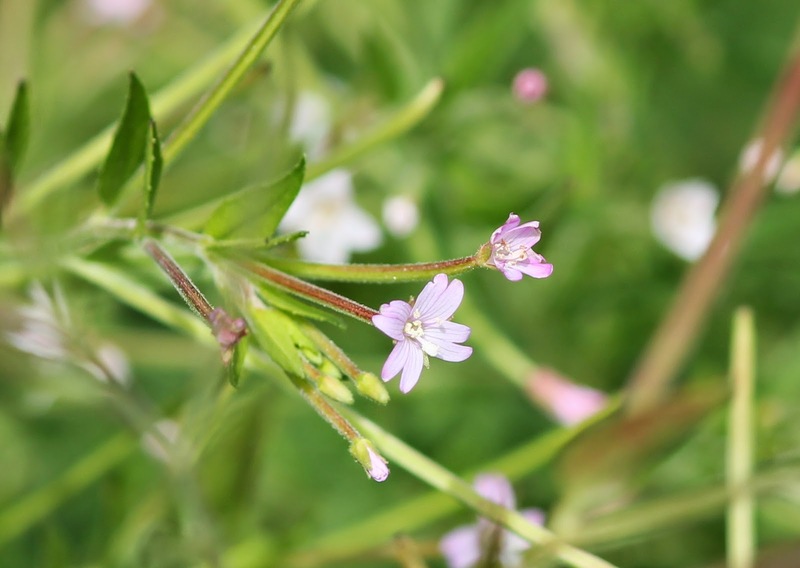 The only thing close is something called 'salt marsh pink' although the petals are different. Here's another more common one I think. Could this last one be meadow sweet? These are the minutiae that occupy my mind! Why did I not take family photos, I don't know. I was too relaxed to bother with cameras. One afternoon at the beach after a nice swim while I sat by myself, I looked up and down the beach and imagined how I would paint it. 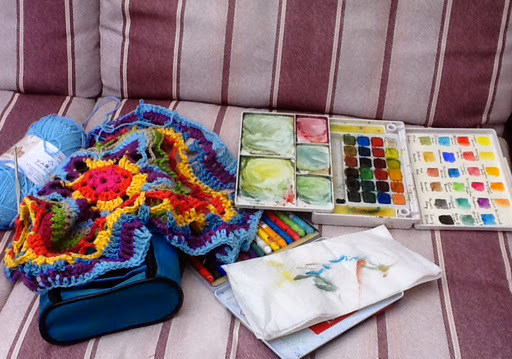 The sketchbook and paint kit were in my bag but I laid there in a lovely stupor. That's what holidays are about I guess. 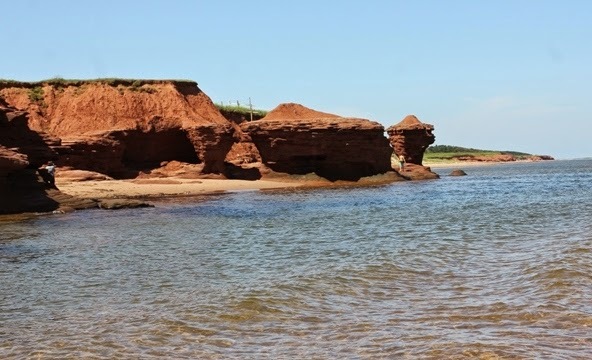 Today, my husband is off to a golf tournament-- yippee I don't have to make supper-- and I am going to the waterfront shop for 3 hours, so no studio time. I'm sharing my lunch salad since it's the only thing I've created lately. 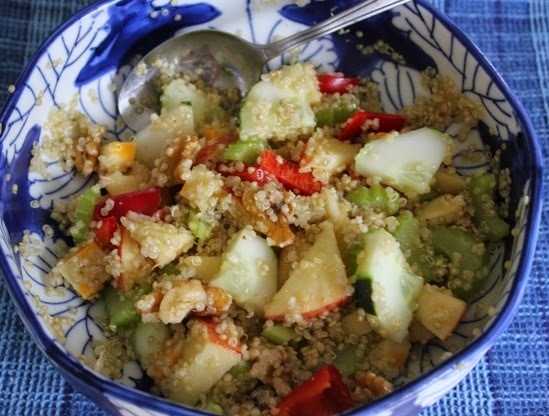 I usually ad lib it but you can find lots of similar recipes on line for exact proportions. We have another week of vacation and we're expecting a visit from my son and his wife so again, I won't be blogging much. In whatever part of the world you are I hope you're enjoying your vacations.